WSU Camp Cosmos is a Cosmic experience! Summer camp dates are weekdays from July 9-20. 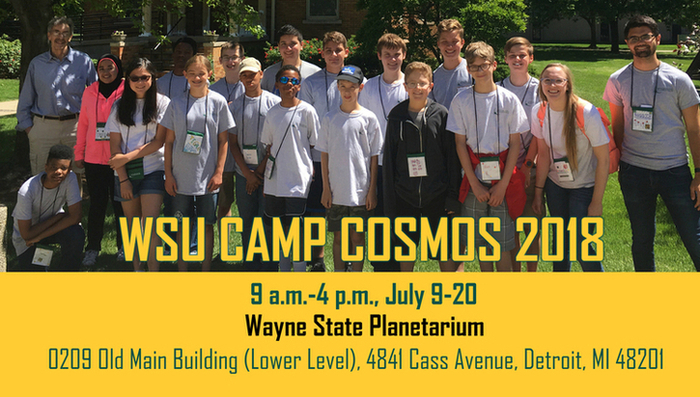 Base camp for this program is the Wayne State University Planetarium! Students will investigate the night sky and explore astronomy beginning in our own Solar System, then expanding outwards to the Milky Way galaxy and the university beyond! Learn about the Big Bang, stellar evolution, supernovae, neutron stars, black holes, galaxies and cosmology as well as current mysteries like dark matter and dark energy! In addition to these out-of-this-world experiences, we'll also do field trips to local venues, like the Detroit Institute of Arts and Wayne State's Rock Climbing wall. Camp costs $375, which includes a $25 non-refundable deposit. No refunds are available for cancellations made after June 30. Camp fee includes lunches, snacks, camp t-shirt and admissions fees for all field trips and activities. Please contact Ben Coughenour at 313 577-6455 or [email protected] for more information.